Reindeer are found in Alaska, Canada, Greenland, northern Europe and northern Asia in tundra, mountains and woodland habitats. In summer months Reindeer eat grasses, herbs ferns and mosses. They have also been recorded as being opportunistic carnivores eating lemmings, birds eggs and some fish. During the winter they eat lichens and fungi which they find by sweeping snow and ice away with their antlers and hooves. Given the harsh conditions they live in Reindeer are very well adapted to their environment. Both male and female Reindeer grow antlers. Antlers are made of bone; unlike horns which are made of keratin and therefore antlers can be regularly shed. Male reindeer shed their antlers in November or December whereas females retain their antlers until spring time. Females can then use their antlers in winter to push through the snow to find food. It has recently been discovered that Reindeer are sensitive to ultra violet light to cope with the long dark winters in the Arctic. Snow and ice reflect UV light whereas urine, predators and lichen absorb UV light. Reindeer have special Nasoturbinal bones in their noses which aid to warm each inhaled breath on the way to the lungs and cool the exhaled breath, condensing the water vapour before it can be exhaled. Reindeer have a thick fur coat made up of two layers of fur (a soft fine undercoat of insulating hairs and a long coarse outer layer to help protect from the rain and snow). The coat also traps air when in water which helps make the reindeer buoyant, aiding swimming. The thick winter coats are shed each spring and regrown each year for winter. A reindeer’s hooves adapt according to the season. In the summer their footpads are sponge-like aiding grip on the wet and slippery tundra. In the winter their footpads shrink leaving an exposed sharp hoof rim which cuts into the snow and ice to provide secure footing and dig through the snow for food. 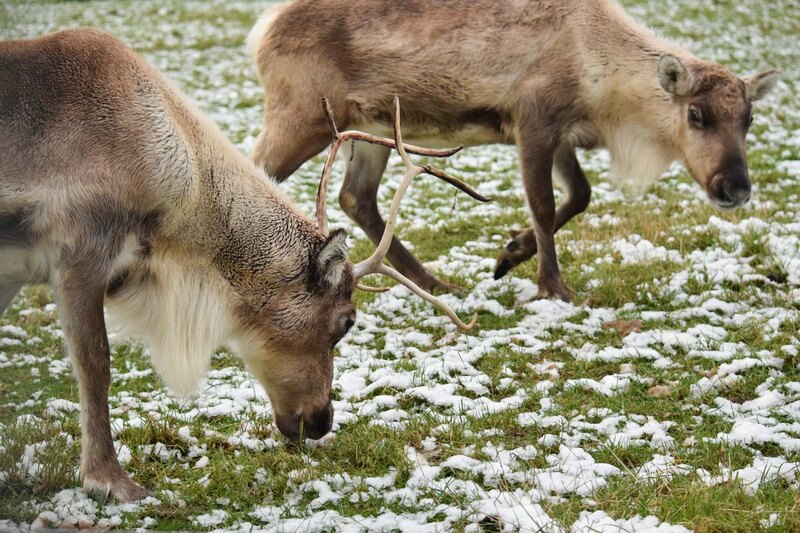 You can find out more about the Reindeer we have here at the zoo and all our other amazing animals on our animal A-Z pages.